The reality is that as we said in our last CRM blog post “Your clients are the foundation and reason for everything you do in your business.” Customer Relationship Management (CRM) is how you keep track of your most vital asset your customers. Now comes the hard part, choosing the best CRM Software for your business. 1. Consult with everyone in the organization who interacts with outside clients, vendors, prospects, etc. — What type of information are they tracking? Where do they keep this information? Who has/needs access to the information? What additional information would they like to track/ have access to? 3. Will you need it to interface with other software systems? Some CRM systems will have all the modules you need others will not. Talk to all your department directors to see if they want/need to interface with the CRM system. Warning – The departments who will get them most benefit from a CRM system are sales, service and marketing; so if it has all that they need – that is what you need to consider first and foremost. 4. Training – There is learning curves to any software (as the Healthcare industry is painfully learning.) Are you willing to pay for training for each person who will be using the software? Choosing to do so will see a greater return on investment (ROI.) By only training the manager— they in turn train must their employees. Also, your employees are receiving the information second hand and not from an expert. That is why KISS is so important – consider the learning curve and how it will affect your business. 5. To Cloud or not to Cloud – First what is the Cloud. Put most simply, cloud refers to any software system that you access over the Internet rather than hosting it on your own computer. The software itself runs on computers in data centers. The advantages of this are self-evident; access to customer information anywhere, no specific hardware or software required to be purchased or update. It can create the potential for your staff –e.g. 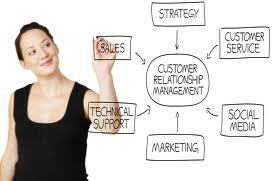 sales and service to collaborate on customer relationships. Software as a Service (SaaS) reduces the total cost of ownership. 6. Good customer service Paying attention to strategy, business processes, technology, and people management is the what, why, how, and when of the CRM technology. All processes in most cases can be found in one CRM system. This entry was posted in Customer Relationship and tagged Business, Cloud, Cloud computing, Customer Relationship management, Customer service, Direct Mail, KISS, Marketing, Sales and Marketing Productivity. Bookmark the permalink.